"Readers of economic and political theory as well as students of economic planning will appreciate this classic, now available for the first time in English. 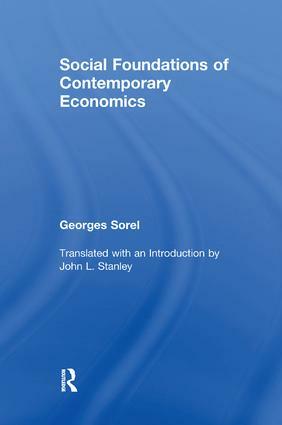 Written eighty years ago, when Sorel became disillusioned with the official socialism of the German and French Marxist parties, this new translation presents Sorel's analysis of the rise and fall of the two great modern ideologies: socialism and liberal capitalism. At present, when the fate of both of these ideologies seems in doubt, Sorel's analysis remains particularly insightful and fresh. Sorel explains why they seem to have fallen into disrepute just as they succeeded in an almost total monopoly of power in the advanced industrial countries of the world.Sorel notes a striking parallel in the historical evolution of both bodies of thought: productivity was the foremost ideal when both movements were at their most dynamic and socially effective stage. On the other hand, they were at their most decadent state when they no longer separated themselves from politics and embraced the ideals of social unity. This work is an attack on the time-honored notion of community solidarity whose Platonic and Aristotelian versions find their contemporary counterparts in notions of natural sociability and political obligation. This work anticipates much of the thinking that lies behind Sorel's famous Reflections on Violence and clearly expresses the moral basis of that work, as well as present tendencies in normative and empirical political thought."